Low-maintenance and maintenance-free KS PERMAGLIDE® plain bearings are largely insensitive to dirt. Low levels of soiling, e.g. from the air, are embedded in the plain bearings and do not impact the durability and runnability. Protecting the bearing position is recommended in the event of greater exposure to soiling or in the case of an aggressive environment. Gaskets can thus prevent damage on the plain bearings and significantly increase the durability of the plain bearings. Damage caused by soiling, such as scoring of the bearing sliding surface, are prevented by sealing. The gasket prevents dirt components from reaching the contact zone between the bearing and the shaft. The corrosion of the interacting sliding surface in aggressive media is prevented through sealing. 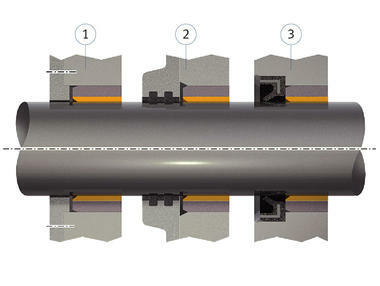 A rubber seal protects the KS PERMAGLIDE® plain bearing bushes from P11 from coarse soiling. Bearings on articulated joints of concrete placing booms: To ensure that no dirt can enter in the rough operating conditions, the bearing position of the KS PERMAGLIDE® P11 plain bearing bushes has been sealed with grease. In particularly rough operating conditions, the durability of gaskets made from rubber or similar material is restricted. The durability can be extended through regular re-lubrication. We recommend consulting with the gasket manufacturer to determine the suitability of the gasket for the intended purpose. Motorservice offers shaft seals, sealing rings, sealing compounds and many more gaskets from the Elring brand.